Cheddar cheese and garlic go so well together in these cheese and garlic biscuits made with a King Arthur recipe. Garlic– you either love it or you hate it– and I am on the “love it” side of the debate so I was happy to smell the aroma of cheese and garlic biscuits throughout the house as they baked. Serving biscuits with chili, soup, or baked fish like paiche would be a nice meal for your family. The #Breadbakers are loading up on garlic this month, won’t you join us? We have an extensive list of garlic recipes to share with you, but if you omit the garlic and make some of these recipes in a plain version, we won’t mind a bit. Just enjoy baking! This recipe comes from the ever-reliable King Arthur Flour collection of online recipes. I added a healthy dose of garlic to their savory cheddar cheese biscuits– garlic in the biscuit dough, melted butter & garlic brushed on biscuits fresh out of the oven, and even more garlic added with an optional dollop of garlic-butter. Yes, I do smell of garlic now myself but it is worth it! Self-rising flour, cheddar cheese, garlic and heavy cream are the only four ingredients for the biscuit dough. A food processor makes quick work of making the dough and it took little time to cut these beauties into 2 inch circles before baking. So easy, so very good. These biscuits look absolutely perfect! I can only imagine how light, fluffy and delicious they are. They look so appetizing. I am on your side of the garlic debate. I only wish the rest of my family enjoyed garlic as much as I do! Wonderful looking cheese and garlic biscuits. I loved the way you clicked them! 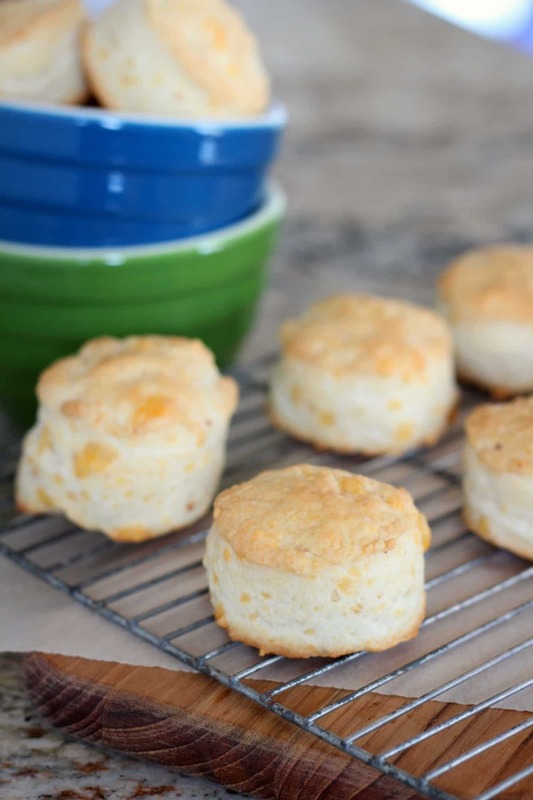 I love cheese, garlic and biscuits so I think you baked these with me in mind. I completely agree with you about KA’s recipes. Always reliable. I thought of you while I baked these, Karen. The grocery store was out of fresh garlic and the only option was bagged, peeled garlic cloves. I had never bought that type before but gave it a try. It was grown in GILROY, CA! I had you, the Garlic Queen, in mind. Holly, these sound scrumptious!!! I’m a huge garlic lover!! What a great bunch of garlic recipes this month! These remind me of the biscuits from Red Lobster. I haven’t been there in years but will always remember that combination of cheese and garlic and swoon…I need to try these! Yes! I had that thought too. I hadn’t been to Red Lobster in years but my in-laws wanted to go when they visited over Christmas. The biscuits there were the highlight for me and they were so similar to these– you can’t go wrong with garlic and cheese! Those biscuits look so tall and fluffy! Some puffed up more than others, I think I need to be more consistent when cutting out the biscuits but I was happy with these for sure. Love garlic! What a great recipe. And all of the others look great, too! Because I love most anything with garlic. Maybe though I wouldn’t like chocolate with garlic, but that’s about it! I haven’t tried chocolate and garlic before and will have to think about that a bit more before putting those two flavors together. Sounds interesting! I love a good biscuit. These sound amazing! Me too! A biscuit adds a touch of home to any meal. You got a beautiful rise on those biscuits and how can you go wrong with cheese and garlic? Thanks, Wendy, I am looking forward to playing around with flavors and making these biscuits again! Biscuits look so light and fluffy. I can imagine how the aroma of garlic must have been all over the place. I’ve yet to try baking biscuits. Your recipe has tempted me to try them out soon. 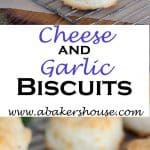 Love the idea of having garlic and cheese in biscuits! I need to try making these..have never tried my hand at baking biscuits! Yours look gorgeous! Love to have these with a cuppa of tea… prefect. Holly how beautiful, light and crisp your biscuits look. Cheese and Garlic biscuits what a fabulous idea. I am definitely pinning this one to make soon.